Alec Lochore of Musketeer Event Management and Stuart Buntine of BEDE Events have joined forces to launch an exciting new CIC3* Grand Slam, thanks to generous sponsorship from Shearwater Insurance. The Shearwater Insurance Tri-Star Grand Slam has a refreshingly tempting £50,000, ‘winner-takes-all’ prize for any rider who can win three of the five CIC3* events; Burnham Market International, Belton International, Houghton International, Hopetoun International and Burgham International in 2016. Jeremy Lawton, Managing Director of Shearwater Insurance, is a long-standing supporter of eventing, Shearwater Insurance famously owning 2004 individual Olympic gold medal winning Shear l’Eau as well as his 2000 Olympic team silver medal winning brother Shear H2O. Jeremy’s in-depth knowledge of the sport ranges from horses starting out at their first events to those tackling the biggest competitions on the circuit. “We are delighted to be sponsoring the Shearwater Insurance Tri-Star Grand Slam. 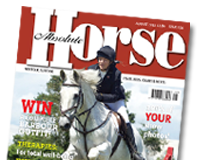 Being experienced event horse owners ourselves we have supported the sport for many years and recognise the importance of offering good prize money across all levels of competition. “The costs involved in owning, training and entering horses have only increased and we want to ensure that all riders have the potential to cover these costs. The hope is that by creating a prize pot of £50,000 we can not only support dedicated owners and riders but also raise the profile of the sport. By pitching the prize fund at the 3* level we believe that we have created a real opportunity for aspiring and amateur riders to win a significant amount of money,” explained Jeremy. Early rider feedback has been positive. Australian Badminton winner Paul Tapner commented: “Eventing is a hugely popular, exciting and extreme equestrian sport. It is long overdue a prize fund to match its exhilarating nature and reward the expertise and dedication of the participants, both human and equine.